The goal of the Forum is for participants to share practical experiences on the successes and challenges of sustainable coffee production, processing and trading. Against this premise, the rationale of the forum is to draw input from participants to generate ideas, innovations, best practices, recommendations and proposals on how documented success can be sustained and scaled up and how challenges can be addressed to ensure an effective implementation of sustainable coffee practices. To commemorate the first International Coffee Day , world coffee leaders meeting in Milan at the Global Coffee Forum made this morning the Coffee and Sustainability morning. 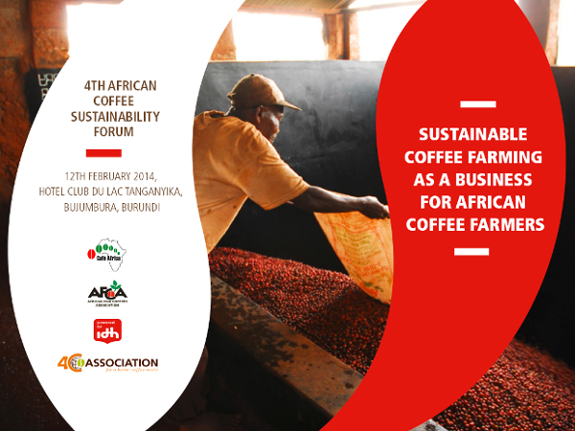 Bujumbura, 17 February 2014 – The 4th annual African Coffee Sustainability Forum took place in Bujumbura, Burundi, on 12 February 2014. Under the theme “Sustainable Coffee Farming as a Business for African Coffee Farmers: Learnings, challenges & joint efforts for solutions”, the Forum brought together 150 stakeholders to address the key factors influencing the adoption of sustainability practices by African coffee farmers. In his opening speech, Burundi's Assistant to the Minister of Agriculture and Livestock, Mr. Boniface Mwikomo remarked: “The ‘Business Case for Sustainability’ no longer needs to be proved, provided that the activities that lead to sustainability are helping the coffee farmers to improve their productivity and the quality of their coffee. This in turn should result in safer and more stable revenues for them”. Considering the focus of this year’s Forum, it was positive to note the emphasis the audience placed on the potential of considerably increasing African coffee production. To do so, productivity in coffee farming needs to be increased thus becoming a more viable business case for coffee farming households. All participants stressed the need of a broad sector collaboration including governments, coffee producers, private sector, and NGOs, putting the farming family livelihood at the centre of all efforts. This idea was also emphasised by Mr. Nsibirwa: “In the African context, where yields are quite low, the very first step to make coffee farming a sustainable business for smallholders is to support them in increasing their productivity. For this to happen, all stakeholders need to unite efforts to provide the much needed support to farmers. This Forum is bringing them all around one table and taking their ideas and applying them in the African coffee fields”. Ted van der Put, Director and Executive Board member of the Sustainable Trade Initiative (IDH), commented: “This year, the African Sustainability Forum has stimulated some great discussion on the core sustainability issues present in the African coffee sector. IDH hopes that it’s recently published business case studies on Uganda and Ethiopia can be used to stimulate meaningful investments in the sector, particularly in the development of a national sustainability curriculum”. As participants represent trade, industry, research and civil society organisations from major coffee-producing countries in Africa, Latin America and Asia, a unique feature of the Forum was the interactive working group session. 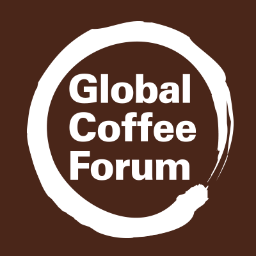 In these parallel groups, action plans addressing the business practices of coffee farmers, climate change and gender were developed and later presented to the Forum’s audience. A key message was that the proven benefits of providing capacity building to farmers on good agricultural practices can be even more rewarding if they follow a gender-sensitive approach. The Report from the Forum, including conclusions and action plans, will be available to download from http://www.sustainableafricancoffee.org/. The 4C Association is the global platform that brings together stakeholders in the coffee sector to address sustainability issues in a pre-competitive manner. The Sustainable Coffee Program is a mainstream public/private consortium powered by IDH, major coffee industry representatives, trade and export partners, civil society organizations, governments and standard setting organizations. The African Fine Coffees Association (AFCA) is a regional non profit, non political, member-driven association representing coffee sectors in 11 member countries. Café Africa is a non-profit organisation created in 2006, with the aim to seize the opportunity of both the increasing global coffee demand and the Africa’s production potential to contribute to the sustainable alleviation of rural poverty. Under the facilitation of Intercafe, AFCA and the 4C Association and with the valuable input of Fairtrade UTZ and Rainforest alliance. More than 30 Burundian participants from different coffee groups across the country met for an awareness half day on the different approaches to sustainability and the sustainability challenges in the Burundian coffee sector. Officiated by the Secretary general of Intercafe Oscar, retaliated the need to have the different participants in the industry understand what the different standards bring in relation to supporting the Burundian coffee farmers achieve a sustainable future. The session was also meant to help the different stakeholders participate effectively in the 4th African Coffee Sustainability Forum. The promotion manager Intercafe noted that their approach is to ensure there is enough capacity to facilitate at least 10 % of the farmers a year to effectively take part in this programs. With one week to go all available places at the 4th African Coffee Sustainability Forum have been pre-booked. Registration has closed and for those that were not to lucky to grab a physical slot, we will be offering you a virtual peep in the days after the forum . See you at the shores of the Great Lakes to Inspire the Sustainable Resurgence of the African Coffee Industry. 4th AFRICAN COFFEE SUSTAINABILITY FORUM! TWO WEEKS TO GO! The African Fine Coffee Association (AFCA) in collaboration with the 4C Association and the Sustainable Coffee Program powered by IDH is organizing the 4th African Coffee Sustainability Forum: “Sustainable Coffee Farming as a Business for African Coffee Farmers: Learnings, challenges & joint efforts for solutions” on 12th February in Bujumbura, Burundi. The Forum will take place one day prior to the start of the 11th Africa Fine Coffee Conference and Exhibition. Please view the program here. REGISTRATION CLOSED! ONLY LIMITED SEATS WERE AVAILABLE! We will make available all results in this blog so if you missed a seat then we will provide you a virtual one! The delegates of the 11th AFCA Conference, can directly register for the Sustainability Forum via the AFCA website. Due to space limitations, total Forum registration is limited to the first 150 participants. SPEAKER PRESENTATIONS NOW AVAILABLE FOR DOWNLOAD! Whether you attended the 3rd African Coffee Sustainability Forum this year or couldn't make it to the event, you can now access all the speaker presentations online. To access these go to the presentations page and click on the relevant presentation title. You can also view the photos of the Forum in our photo gallery. Though convened by 4C in the spirit of encouraging dialogue not all views expressed are of 4C Assoc. Ethereal theme. Powered by Blogger.